We follow a stringent process for selection before the student is enrolled at IIT POINT. students will be shortlisted from the received application forms on the basis of past academic performance and achievements. TALENT HUNT EXAM for 8th, 9th and 10th Std students. The Faculty is a guiding strength as well as an inspiring aspect in making student winner now and ever. We are in the education industry with the moto of ensuring academic excellence in every student trained by us, so we have own study Centers across India. At IIT POINT we not only emphasis on academic excellence but we conduct regular Motivational Seminars and Workshops. Every successful built manor has a deep rooted foundation and staunch pillars. IIT POINT was also formed with similar concoction of the best teaching experts from across the country at Nagpur in the year 2009 and expanded their branches in Mumbai at Andheri, Borivali & Nerul. These great minds came together with a clear and legitimate motto to provide quality education and comprehensive training and best coaching for students in their Board, IIT-JEE, JEE Mains, JEE Advannce, AIPMT & NEET exams. Since its inception itself, IIT POINT was very Solicitous about the all-round performance of students in their respective exams. We follow all the best possible strategies to provide our students the latest and the best they deserve. Joined the classroom program for 1 year after 12th. The reading material was one of the best I have come across. The faculty was very understanding and always supported me. Regular tests which were conducted were very helpful. The Institute was good. The faculty was supporting and study material was too vast and polished which helped me to achieve this rank. And I am very thankful to the Institute. Institute was excellent in faculty and other material resources. It is a good place to get into IIT. Faculty was great and supportive. The study material fetches great knowledge about concepts. 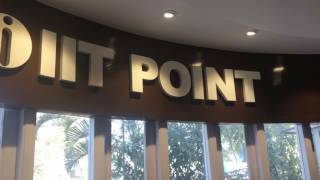 IIT Point is one of the premium institute for JEE Coaching in the country. During my +1 and +2, I avidly used its study packages which was one of the cover stones on which my success was built. The material and the test series it provided are matched by none in quality. I have joined IIT Point for the year 2011-2013 for my IIT JEE preparation. It was good institute, faculty is excellent and study material is worth studying. It has excellent student teacher interaction program which benefitted me a lot. Regular tests also helped me a lot. I am in IIT Bombay Mechanical B.Tech. I joined the DLP of IIT Point and it helped me a great deal to get AIR-342 in JEE 2013. It has good faculty team, detailed study material and test series. The faculty of IIT Point Coaching is highly qualified. Here they form a solid base which helped me to clear JEE Advanced. The study material is up to date and is very helpful. They cover the full syllabus clearing every concept. I N. Sai tejas, B. Tech student studying in IIT Bombay. In XI standard I was very weak at Math and didn't have confidence in Physics & Chemistry. But I came to know about IIT POINT through my Sir. It changed my Life in Education and sirs present there motivated me and gave me confidence. I Rahul S. Gupta was a student of IIT Point of 2015-17 batches. Being an average student I never thought that someday I will achieve an AIR-57 in IIT-JEE. During my preparation sometimes I lose hope and feel Isolated. I Ashish Rathi, being a two year program student of IIT Point joined in 2011 with lots hopes and dreams in my eyes. Amongst several institutes I and my parents decided to join IIT Point for IIT-JEE preparation due to its wonderful faculty team members. The math teacher taught me several tricks to solve questions faster while Chemistry and Physics faculties made every concept easy and interesting by providing lively examples. I Nikhil Kumar started my academic career to the guidance of IIT-POINT, with a lot of expectations on myself and hope on the institute's faculty. I was an aspirant of IIT JEE and I wanted to join the most prestigious institute of our nation IIT into my dream course computer science so I approached IIT-POINT and they gave me perfect guidance to clear the JEE exam with an AIR of 15. They used to help me resolve any issue in my mind. The faculties here are very thoughtful, kind and intellectual. After my tenth, I was in dilemma whether to pursue JEE Coaching, because I am perfect in Maths and Chemistry but poor in Physics, and it is known fact that Physics is backbone for Cracking JEE. But one of my sirs had initiated me to take coaching in IIT Point where it was equipped with extraordinary features like e-tutor, friendly atmosphere between faculty and students, Library Features, Test and analysis, Paper discussion, etc. This made me to crack JEE and also made my Physics very perfect.